20 years in the making, Hamilton and Thomas, Two song writers and friends. Have been putting together some of the most interesting and Intense music of their lives. A music duo from Miamisburg Ohio, Kirk Hamilton and Thomas Liming first started composing their own brand of Rock back in 1992 when both artiest where in their early 20s. 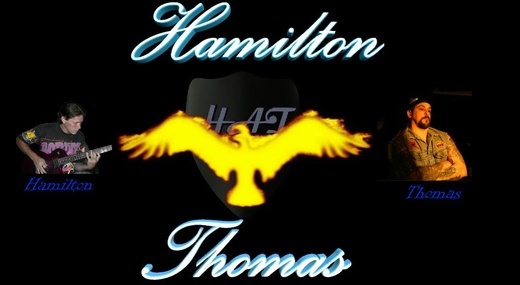 Thomas’s main job was Piano and lyricists while Kirk took command over vocals guitar, composer. Driven by a passion of creativity to make their own compositions with dreams of hopefully breaking out into the mainstream. The two friends would spend countless hours of every day slaving over different ideas and musical interest. Gaining inspiration from musicians like Randy Roads and Jake E. Lee to Bands Like Journey and REO Speed Wagon. But the Tree Of Inspiration didn’t just stop at flaming guitars and Perfect Pitched Vocals. The two writers where even influenced by a deeper root of the musical genera of R&B and Soul as well as Jazz Fusion and POP. Ups and Downs, Marriages and whatnots, time flew by. Lives changed and the music got put away. At one point the two friends had to go separate ways to live out their lives but always staying in touch keeping up on each other musical ventures. Thomas Liming has had some minor local success with two original Rock Bands. And Kirk Hamilton has Played guitar and been guest vocals on many Local recordings as well as written and recorded his own Original Material. Today there is this cool thing called Digital Home Recording Software and the Internet. Which has allowed these two talented musicians and friends to come together over a vast distance. It’s a new and unique way for these two guys to once again be able to Jam, Write , Record and have a good time. Today the writting process is smoother due to all the experience Kirk and Thomas have gained from continual practice and writing. Today, Kirk Plays Guitar ,Bass ,Piano and sings and Thomas Plays Drums , Piano, Sings. Today it’s all for fun and their putting it out there for free. So come and check them out. You never know what they’ll pull out of their Hat.